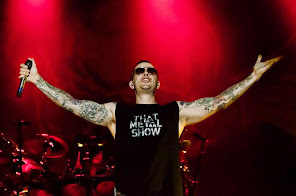 Avenged Sevenfold News: Avenged Sevenfold's M.Shadows: "A lot of my favorite bands have been ruined in that way"
Avenged Sevenfold's M.Shadows: "A lot of my favorite bands have been ruined in that way"
Below one of the highlights during the Renman Live, (click here to watch the video) M.Shadows said: "We’re not sitting on Instagram all day showing you what we ate for breakfast,' cause there's a sort of mystique that you wanna keep. When I grew up, my favorite bands, I didn’t know what they looked like, I didn’t know anything. And when I did see them, it was like "oh my God! ", and now you get bombarded with every interview being knit picked for click bait online and that’s a little annoying to me 'cause a lot of my favorite bands have been ruined in that way, where they just get over exposed."